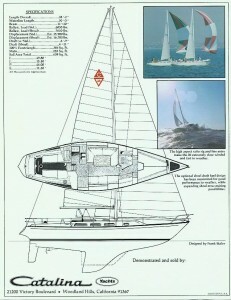 The original boat was designed by Sparkman and Stephens to be built as a one-off racing design. 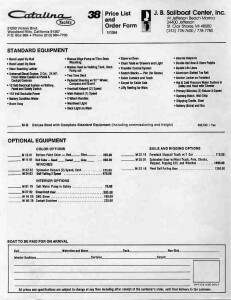 The hull form was then purchased by the Yankee Boat Company in Marina del Rey, California. They built approximately 30 Yankee 38’s before the business failed. 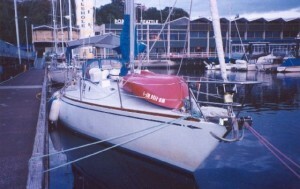 The Yankee 38 had a shorter mast, single spreaders, and a longer boom. It had a 7 foot draft and a skeg-hung rudder. It had more of a traditional look with a deck house and smaller ports. The interior was not as light or roomy, with a pilot berth built into the starboard side of the cabin. 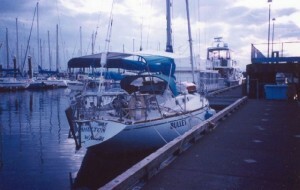 There is a Yankee 38 named Bullet berthed in Shelton, WA. 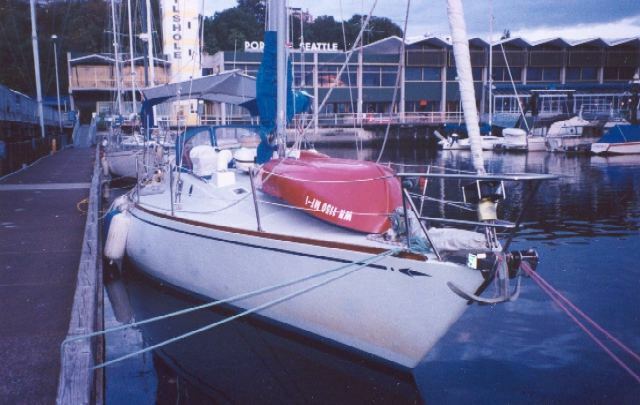 Also, a Catalina 38 owner reported that an infamous Yankee 38 called Damn Yankee can be found in Olympia, WA as well. 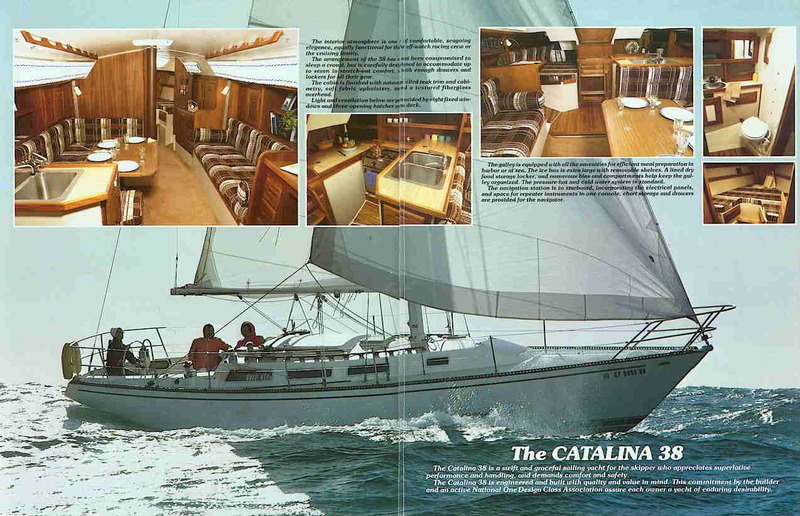 It is a well known boat (hull #4 or 5) and can be found next to his Catalina 38, “Cyrena”! 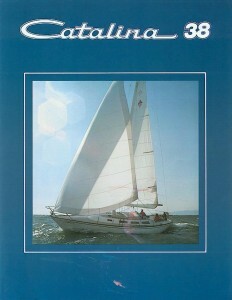 Frank Butler of Catalina Yachts purchased the molds from Yankee, and started building our boat. 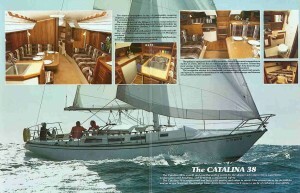 He wasn’t content with redesigning the interior and giving it a Catalina deck. 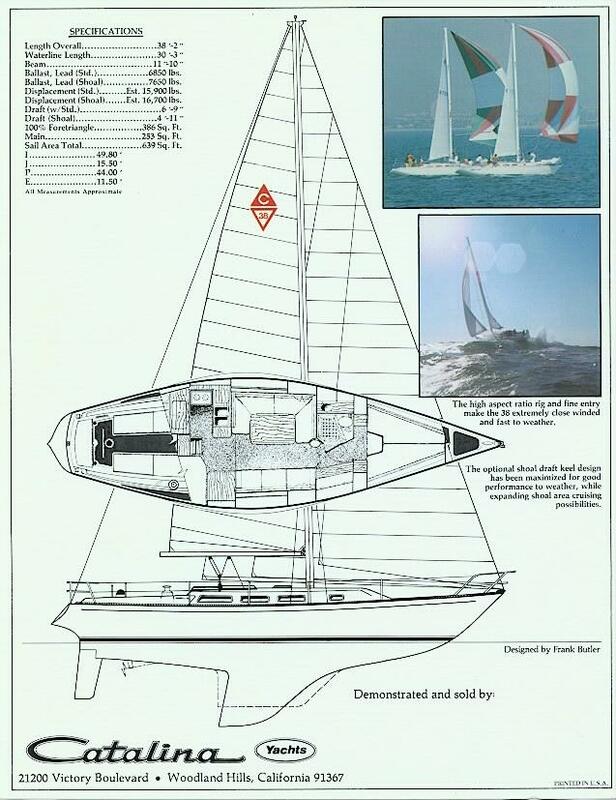 He put a taller mast, shorter boom, and moved the rudder and made it a balanced spade design for faster tacking. He also, so the story goes, called Sparkman and Stephens for permission to advertise it as a Sparkman and Stephens design. It is said that they asked for a royalty way beyond what he was willing to pay and he politely refused. 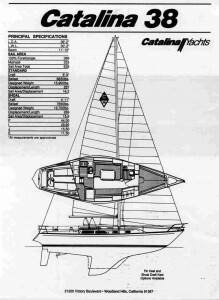 He made the Catalina 38 a faster boat, and as a result for years it replaced the Cal 40 as the official Congressional Cup boat, one of the top match racing regattas in the world. 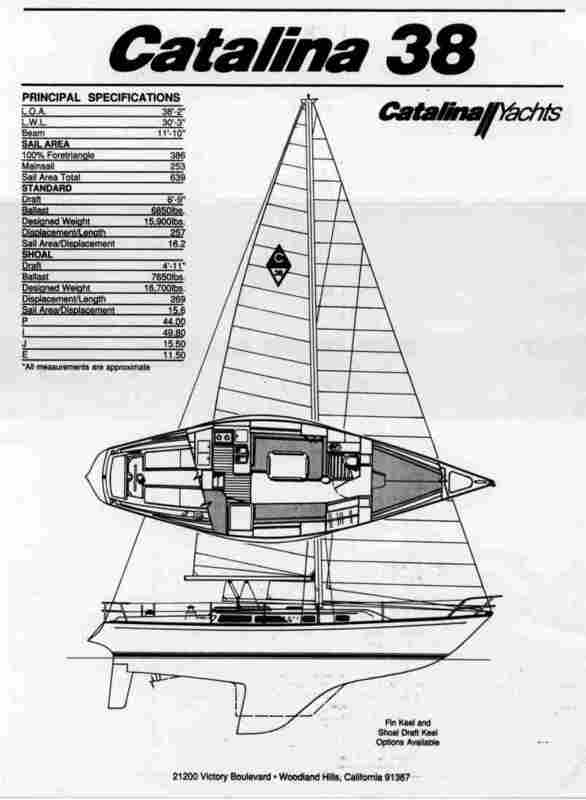 It was, in turn, replaced by the Capri 37, also made by Catalina Yachts . 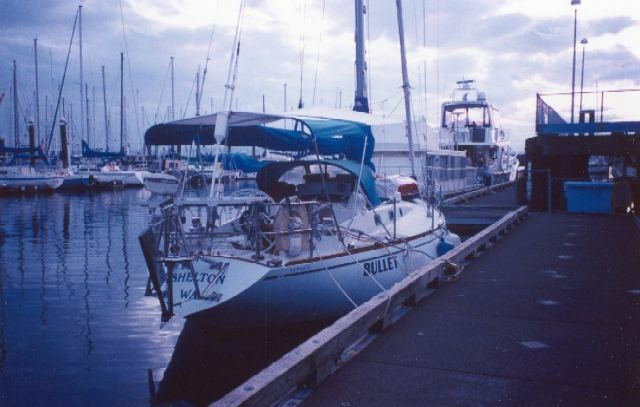 If you ever see a strange looking Catalina 38 with a single spreader rig and a longer boom, it is hull number one. Also, a few 38’s were steered with a tiller, but it was quickly determined that it was a little more of a handful with a tiller, so all thereafter were built with a wheel. It is possible that all the tillers have since been replaced with wheels. The original power plants, Atomic four gasoline engines, were replaced with 3 cylinder Universal diesels. A fascinating article on the racing configuration of the Catalina 38 can be found in the 8th edition of Royce’s Sailing Illustrated. 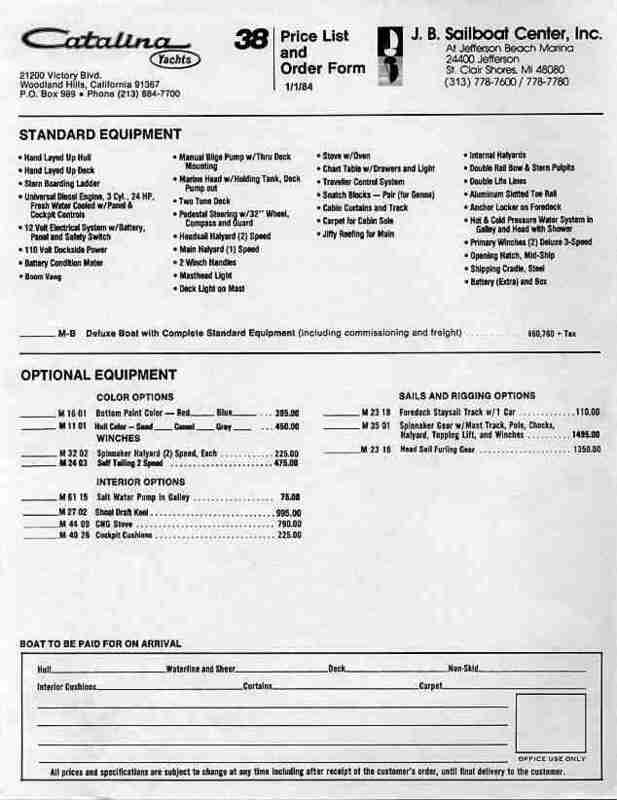 NOTE: Below are specifications sent in by our members. 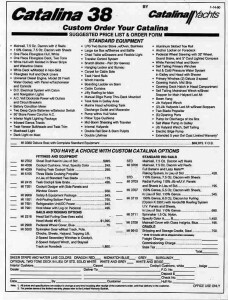 Please keep in mind that our boats did change through the years and therefore the particular “specs” listed should be carefully verified on your own boat! This is especially true regarding sail size with a furler! 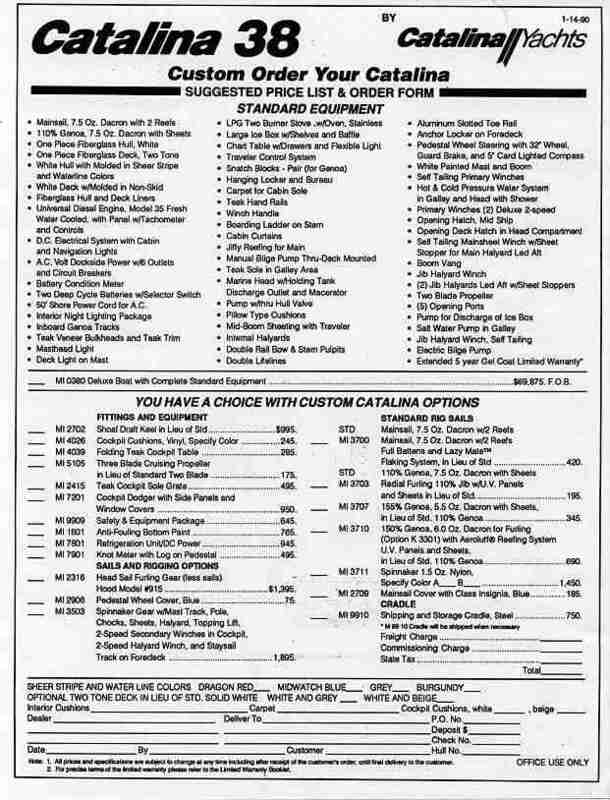 Ice Box Capacity 5.5 cu. ft.